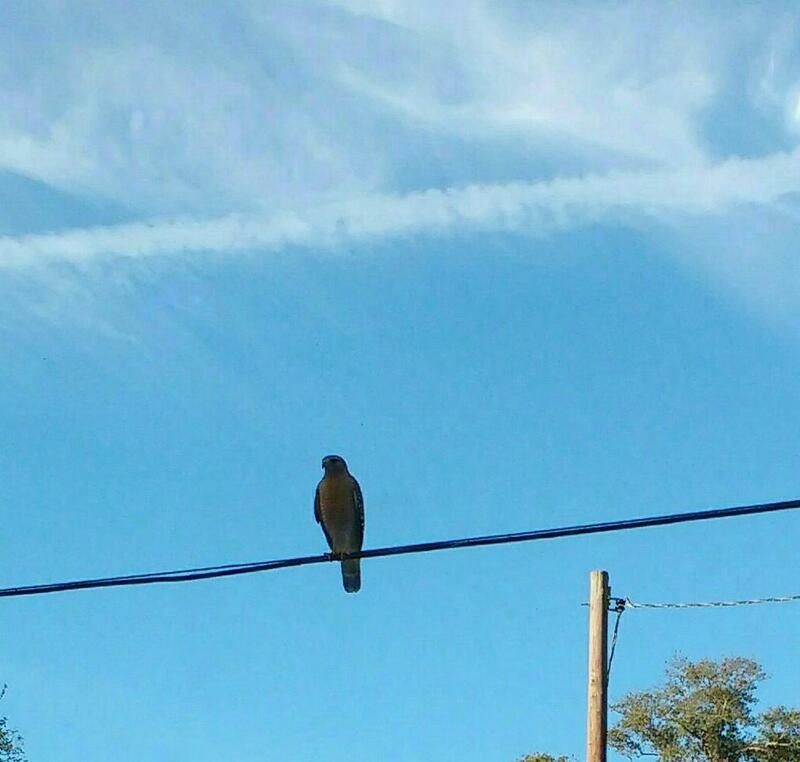 Last Saturday, I was startled to see a red hawk perched on the black cable in front of our house. A rare sight, and he was intently staring down at me as I went to close the curtains on the glass porch door. I knew something was up. My motivation for closing the curtains had been to avoid greeting any unexpected visitors that may drop by. It was late in the morning, and I had been reading on the sofa, still wearing my comfy pajamas. A thought had suddenly come: Get up and close the curtains. Someone may be coming by. What a surprise that it was a hawk visitation! Hawk has always been a special angel messenger to me. A sign to pay attention to the big picture. To get ready for an opportunity that may come your way. Heeding the message, I got dressed to meet the day. A few hours later, at lunch time, there was a knock on the door. The guidance had been in divine order, and I had renewed faith that my inner-hearing was better than I thought. Something I often need reassurance on. Then yesterday, hawk synchronicity was at play when I happened upon this amazing story on-line while studying the weekly Bible lesson on Life. In Guideposts, Ronald Pinkerton describes a near accident he had while hang gliding. He had launched his hang glider and been forcefully lifted 4,200 feet into the air. As he was descending, he was suddenly hit by a powerful new blast of air that sent his hang glider plummeting toward the ground. “I was falling at an alarming rate. Trapped in an airborne rip tide, I was going to crash! 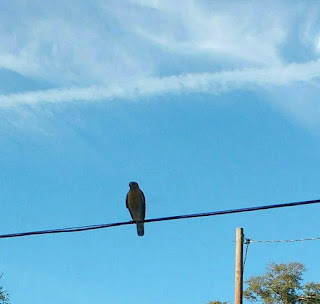 Then I saw him--a red-tailed hawk. He was six feet off my right wing tip, fighting the same gust I was . . . I looked down: 300 feet from the ground and still falling. The trees below seemed like menacing pikes. I looked at the hawk again. Suddenly he banked and flew straight downwind. Downwind! If the right air is anywhere, it’s upwind! The hawk was committing suicide. Two hundred feet. From nowhere the thought entered my mind: Follow the hawk. It went against everything I knew about flying. But now all my knowledge was useless. I was at the mercy of the wind. I followed the hawk. One hundred feet. Suddenly the hawk gained altitude. For a split second I seemed to be suspended motionless in space. Then a warm surge of air started pushing the glider upward. I was stunned. Nothing I knew as a pilot could explain this phenomenon. But it was true: I was rising. What a wonderful testimony to follow that still inner voice when faced with a crisis, and not simply rely on what we think we humanly know best in the midst of any threatening situation. I'm so thankful for the abundance of unseen celestial help that is available to us. God is Love and is All-Knowing and ever present. Angels will bring whatever catches our attention to bring us a message of assistance. How comforting to know that in the midst of great adversity, a way will open up if we trust and have faith in the guidance. Psalm 91 is the prayer of protection that charges the angels to watch over us and lift us up to avoid the stones on the path, but we have a part to play by daily keeping our consciousness on high, in the Shadow of the Almighty. Nothing is impossible with God. "Trust in the Lord with all your heart, and lean not on your own understanding."